Today I want to share an idea with you for an inexpensive game that you can make using simple household items. The inspiration for this game was a young boy I am working with to develop simple turn-taking skills. I wanted to begin by teaching him a short, simple game like Tic-Tac-Toe, but his fine motor skills aren’t yet developed enough for him to make the marks on a page without great effort. I wanted the game to be fun and easy for him to play so he would stay engaged in the learning activity. My young friend does better with 3-D manipulatives at this stage of development, so I took an empty cardboard egg carton and cut it to the size I wanted. That left me with a perfect grid for Tic-Tac-Toe as you can see in the picture above. Next, I gathered up blocks in two different colors so we could use those instead of writing X’s and O’s. I removed the label from an empty frosting can and washed it clean so I could store the blocks in it. The child and I took turns placing a block in one of the egg cup spots, working to get three in a row. The game is more visually appealing to the young child, and it’s easy to show when there are three blocks of the same color in a row. It also offers some tactile input for the hands-on learner, and removes the demand of writing for the child with fine motor difficulties. If you don’t have blocks, you could substitute two different colors of another object such as milk caps or pom-poms. Just find something that will fit within the egg carton space and that is available in two colors, and you are set to go. For some children, this game can be used to focus on taking turns without the added task of learning the rules for Tic-Tac-Toe. In that case, you don’t even need to sort manipulatives by color since you just need objects that are small enough to fit in the egg carton compartments. The simple back and forth of placing items might be a starting point for some children who have difficulty sustaining attention and interacting with others. For children on the autism spectrum, this is one more way to work on extending interactions and giving a sense of task completion. In addition to using this game to teach Tic-Tac-Toe and turn-taking, you could use it as a reinforcer. Each time the child completes a task, they could put a block in the egg carton. 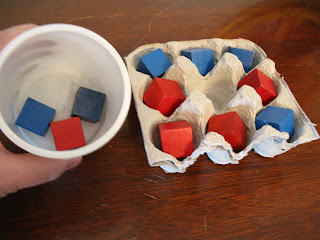 Another idea is to put a number of blocks in the egg carton to represent tasks the child is asked to do, and remove one block each time another task is completed. When the carton is empty, it’s break time. Put some non-skid shelf liner under the carton to stabilize it so it doesn’t slip around too much. For children with fine motor challenges, I’ve used Velcro on the bottom of each egg cup and stuck the egg carton onto strips of Velcro on a plastic cafeteria tray so the egg carton stays put while the child works with it. There you go! An easy and inexpensive game that can be used multiple ways and made with items you probably already have on hand! Have fun! Here is an idea for an easy matching game for colors and sizes using recycled materials you probably have in abundance. Start saving the plastic lids from jars – peanut butter, mayonnaise, milk and juice jugs, pop-up wipes, etc. When you have a collection of lids, take a plain file folder and arrange the lids however you like on top of the file. Trace around the lids, then remove them and color in the circles to match the lid colors. I didn’t color in the circles for the small milk jug size since most of my small lids are the same color, but you could match colors on that size as well if you have a variety in your own collection. I outlined my circles in black to provide a greater contrast to make the target stand out. Store the lids in a gallon-sized zipper bag and you have a quick and easy matching game. The larger lids are great for little hands or for those who find fine motor tasks difficult. To make the game more durable, laminate the file folder. You’ll be able to re-use this game with your own children, plus it’s a great portable game to take with you since it’s lightweight and doesn’t take up much room. It’s an inexpensive, fun way to help kids learn and a great way to recycle those lids.